CAOTICA - Mediator Accreditation, Red Herring, Rip-off or Real Sign of Quality? Red Herring, Rip-Off or Real Sign of Quality? Is 'Mediator Accreditation' a genuine attempt at establishing a source of professional practitioners whose standards are consensually recognised and practised across all areas of mediation practice? Or is it a means of obstructing entry into the field via questionable assertions of quality, and thus a means of charging more for the privilege of entering into this fulfilling profession? These questions continually occupy me as a Mediator and a trainer of Mediators from a background that had a very much 'open door' policy towards those interested in becoming mediators, whether for a career or to offer mediation to their local community, including in-house for their organisational community. How many 'accredited' Mediators are there? How many Mediators describe themselves as 'accredited' when in fact they have just attended an accredited course, and one that has been accredited by a non-mediation related body? - That someone has paid to attend a course and turned up? - Or is it an indication of significant experience and a demonstrated commitment to ongoing development as a disciplined practitioner? I ask these questions for many reasons that arise from my experience of meeting the concept of 'mediator accreditation' over the past few years and the sense that many newly training mediators see accreditation as some form of 'guarantee' of work and of common recognition of their ability to mediate. But also, it is portrayed by some training organisations as a form of 'qualification' for entry into the discipline of mediation. And yet I am contacted frequently by people who describe themselves as an 'accredited mediator', but who are looking for work and/or experience. What has your training provider done to support you in finding work or in creating a career for yourself in mediation? If you are accredited, doesn't that mean you've already found work and been assessed as 'accredited' on the basis of having carried it out and reviewed and improved your practice in the light of the experience? I have seen training courses offered that state that, once completed, the trainee will be 'qualified' to mediate - as if there is a required 'qualification' to mediate - which there isn't. At CAOS Conflict Management we offer mediator accreditation subsequent to our training courses - via attendance at our regular monthly support sessions or themed training events - as indication of the commitment of the attending practitioner to reviewing and improving their mediation practice. But not pursuing this option of achieving our accreditation does not mean someone 'could not mediate' without it. I would have no such authority to state that. And nor do any of the other mediation training providers. Of course we can offer our own form of accreditation but that accreditation does not 'qualify' someone to mediate. They can provide mediation without our accreditation. A training provider's 'accreditation' is just their label for their training, not a 'qualification to mediate'. And where is it proven that the accreditations provided do indeed give a guarantee of 'quality'? I have met many 'accredited' mediators who, while extolling the virtues of the philosophies of mediation, their description of their practice frightens me with the directive, adversarial, partial, and judgemental nature of their approach, which is in direct contradiction of their espoused philosophy. I think that as a body of practitioners we are at risk of spending more time pursuing 'professionalisation' and gaining 'status' than we do ensuring we provide a client-led process that is customer focused, cost effective, and leads to sustainable, genuine resolution of conflict whether in the field of complaints, damaged relationships or contractual disagreements. This preoccupation often detracts from ensuring that what is offered is genuinely an alternative to the adversarial processes traditionally available for responding to conflict. Much of the practice espoused by some accredited mediators I have conversed with are little different from the directive, advocating approach of a lawyer, where they consider their role to be one of diagnosis and recommendation. How is that an alternative? There's nothing wrong with offering yourself as a Mediator on either a paid basis or a voluntary basis, or both, if you have learned a way of providing mediation before you have gained 'accreditation'. In many areas of business or service people start out at a particular stage of development in their role and gradually increase their level of expertise, either on an informal basis or via a formally structured development process. For example you can be an apprentice engineer or mechanic or an accountant that is not 'Chartered' and still offer a service on a paid basis. If you are paying a lot more for your Mediation training because you believe there are 'better' or 'worse' courses to train on, consider how you are making that assessment. On the price of the course? On the 'accreditation' you receive? Or is it on whether it actually meets your needs beyond the course? What do I need to do, how long will it take and how much do I need to spend before I am deemed by you to be able to start practising as a mediator? What support do you offer in enabling me to develop as a Mediator beyond the course, including development of my mediation business if that is the route I wish to take? How much will that cost? Remember: There has been no objective research into the different training approaches taken in mediation and their consequent effectiveness for clients, so be aware that what you are paying for has not been objectively proven to ensure you are an effective practitioner. Our recommendation for our training at CAOS is based on the model having been used consistently in areas of practice for the last 15 years, not on simply having been externally 'accredited', particularly by organisations that are not themselves rooted in mediation practice. Academic and Theoretical or Practical and Experiential? Mediation is a simple process, and importantly so. It offers an informal, confidential, safe and creative space in which to find a more amicable, more co-operative and self-supporting way forward in a difficult situation. It can be entered into, completed and left behind in a short space of time. There is a risk that this highly effective and disciplined practice is made inaccessible to both new practitioners and clients by portraying it as an academically challenging endeavour rather than a personally challenging skill. Mediation is a skill and discipline that improves with continuous reflection and experiential learning, not an academic topic that is completed once a course is over. The notion of 'mediator accreditation' is potentially a Red Herring for people wanting to enter into this rewarding discipline, as it suggests it is 'necessary' before one can start to practise. It is potentially a Rip-off because it suggests a limited access to the discipline and thus implies a higher price can be charged for this (and ever higher as more 'exclusive' accreditations are developed - as is already being seen in the field of Family Mediation for separating couples). And it is occasionally a Real Sign of Quality if it is gained as a result of experience of mediation and demonstrated commitment to reflective learning from that experience and not through simply attending a course. Mediator Accreditation = Consistency and Quality? Where is the evidence? There is an argument for accreditation that says it will guarantee consistency of practice and of quality across the practitioners who provide it. Personally I doubt that. A simple visit to the mediation discussion boards and mediation websites such as www.mediate.com shows how incredibly varied is the interpretation of the process described as mediation, even amongst those who are 'accredited' mediators. There are ever more prefixes added to the name of the process of mediation,such as transformative, evaluative, narrative,solution-focused to name but a few, and they differ substantially in their underlying philosophies and, consequently, their practice. To try to bring these together under one form of 'accreditation' would be placing the quality and effectiveness of practice secondary to being seen as a 'united process'. The world of mediation includes many variations of interpretation and practice, many of which I would question regarding their purpose and long-term effectiveness as a genuinely alternative means of responding to unresolved conflict. But to deny the difference exists would be like any denial of unresolved difference - to put the lid on a boiling pot that will have to burst open at some point in the future. Much of the time, mediator accreditation is, indeed, a red herring. Quite often it's level of importance is over-exaggerated to the extent that it places new trainees at risk of being ripped off. 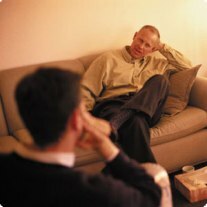 The only sign of real quality is to be found in whether a training fulfils its purpose of providing an effective introduction for trainees to the skills, practices and philosophies of mediation, and, in turn, those newly trained practitioners provide an effective, genuinely alternative means of responding to unresolved conflict for clients, that differs significantly and philosophically from the adversarial 'expert led' approaches that have traditionally been used. I'm happy with the latter being my benchmark and it is the benchmark which I apply to other mediators who I ask to work for CAOS. Accredited or not. CAOS Conflict Management will be running Conflict Coaching Training Courses. The CAOS Conflict Coaching model was developed over a period of 2 years with clients from all across London bringing a range of unresolved personal conflicts within their families,or at work or in their community, to the coaching sessions. The foundations of the process are based on the CAOS Model Principles and Underlying Philosophies of Mediation. Our training has already been used to train Conflict Coaches at a range of organisations including Brunel University. Visit our Conflict Coaching Training page to find out more and register your interest. If you think Conflict Coaching would be of interest to people in your organisation, please visit our Workplace Conflict Coaching page. 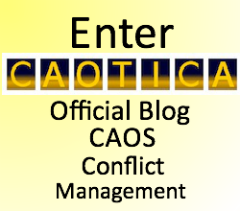 Please contact CAOS Conflict Management on 020 3371 7507 if you are interested in any of our services or training, or visit our website by clicking on the CAOTICA banner below.